I've got exciting news, today, friends. You've probably already gathered from the title of this post that I've launched my own Etsy shop and I'm super duper excited to confirm that's true! 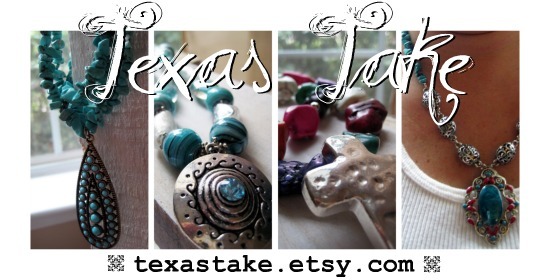 My love of turquoise and chunky necklaces led me to make a variety of designs lately when I'm sitting still during my down time, and since I can't keep them all I'm hoping to start slingin' 'em on my new shop, Texas Take. Head on over and take a gander - and spread the word, Texas Take is open for business!